By activating auto backup facility in Microsoft Word 2007, every there change in Microsoft Word document automatically create file named “backup of name of file.wbk”. 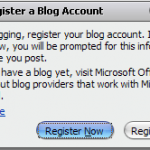 Related to "Activate Auto Backup Microsoft Word 2007"
Great tip. Backing up is very important! I have often lost an original document by accidentally overwriting it. Hi I have turned off the always create backup copy. The system regards a n existing file as a new file when i close it thus meaning that my file is full of wbk files.